One of the misleading claims often made about members of the community of scientists and others engaged in, or supportive of, animal research is that they don’t talk with the public about their work. To the many scientists and others actively involved in a broad array of both formal and informal education, outreach, and community engagement efforts it is obvious that there is, in fact, a great deal of talking about animal research. At the same time, as with any other aspect of science or area of public interest, there is always a need for more outreach and more public engagement. Speaking of Research encourages new outreach efforts and increased participation in dialogue about the responsible use of animals in humanely-conducted and ethical research. For those seeking to become more involved in speaking out about animal research there are many sources of information and existing programs that provide good ideas, models, and assistance in setting up new efforts. This post will begin a series that highlights different approaches to science outreach and education, particularly those focused on research with nonhuman animals. We begin with community outreach and education programs at primate research centers. Many primate centers have active outreach programs built around educational objectives and service to local schools, including programs that provide opportunities for K-12 students to learn about research, internships for college students, and tours of their facilities. The focus on educational outreach and opportunities for students is in keeping with the role of scientists as educators. 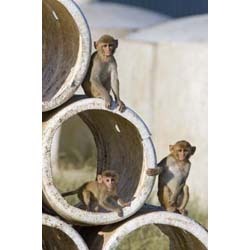 The California National Primate Research Center (CNPRC) is one with a long-standing educational program. Initiated in 2003, “the Education Outreach Program (EOP) was developed as a free, public-service program to introduce K-6 students to nonhuman primates, general health science concepts, animals in research, and biomedical research programs and careers. It supports the California Science Content Standards. This program has been a huge success with the classes visited since it began in June 2003. Comments we have received indicate that the children, as well as the adults, have a greater understanding of primates and health sciences, and the positive benefits that the primate center has on their lives.” The CNPRC website includes links to the curriculum for their outreach program as well as many resources for teachers. There are many other ongoing outreach, education, and community engagement efforts. Those highlighted here provide just a few examples of the types of programs that encourage interaction. Speaking of Research encourages scientists and others supportive of animal research to get involved in public outreach activities through the broad range of existing programs such as those highlighted above, but also by developing new initiatives. Members of the Speaking of Research Committee work actively in many different types of public outreach and education and are available to share advice and experience with others. We encourage you to use the comments section or to write posts to share your own experiences and programs and, by doing so, help to continue to build networks for supporting and increasing these efforts.